Integration of the best research with clinical expertise and patient values. The universally accepted definition: the integration of the best research with clinical expertise and patient values. 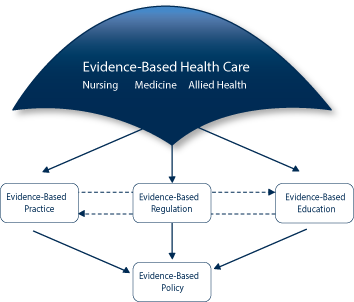 Evidence-based nursing, therefore is a rigorous methodology where all the research data for a particular problem or issue are analyzed together, also accounting for values and expert consensus. Nurse educators incorporate evidence-based practice into their curricula and use evidence-based strategies to support their teaching strategies. Nurse regulators use evidence-based regulation in their regulation of nurses. How has NCSBN contributed to evidence-based nursing education? Is there evidence to support clinical experiences in prelicensure nursing education programs? NCSBN, with a committee of its membership and in collaboration with the educators in nursing and other fields, developed an evidence-based position paper on clinical experiences, which was adopted by our membership in 2005. The position paper was based on a systematic review on nursing education outcomes, and the results of the systematic review have been presented and published in JONA's Healthcare Law, Ethics and Regulation and Chapter 12 in Clinical Nursing Education by Avd & Valiga (2009). While this paper is from 2005, it is still relevant today. How much simulation can and should be used in nursing education programs to optimize student outcomes? NCSBN has completed a multi-site, longitudinal study on the use of simulation. Results of the study were presented in a supplement to the July 2014 Journal of Nursing Regulation, and NCSBN developed guidelines for use of simulation based on the study outcomes. Since this study and the guidelines were released, the use of simulation has increased in the U.S. Does a structured transition to practice program in nursing improve patient outcomes? Randomly assigned institutions to an evidence-based model vs. the institutions' traditional model. Diverse sample included: small, medium and large hospitals; rural, community and medical center hospitals; magnet and non-magnet; non-hospital sites. Competency reports of new nurses were compared to their preceptor reports. See our peer-reviewed articles highliting these results.